Download a credit card theft checklist. There are several practical things that a consumer should do to handle credit card theft or the suspicion of theft. Print the handy checklist to the left to help you along in the process. Theft of a credit card occurs when an entire card is stolen or lost. Unauthorized use of a credit card occurs when a third-party obtains a credit card account number through illegal means and makes charges to that card. Managing theft or unauthorized use requires completing the same steps regardless of whether you have the card in your possession or have misplaced the card. This is because the first actions that a credit card issuer will take upon being notified of either are deactivating the account number and issuing a new card. In cases of theft or suspected theft, the Federal Trade Commission (FTC) states that the first step for any consumer is to notify the credit card issuer of the card's theft or suspected unauthorized use. Preferably, this step should be completed within two business days of your noticing the loss of your card or within 60 days of receiving the credit card statement showing unauthorized use. Doing so within these timeframes will limit your liability for any charges made. Call the customer service number listed on the back of your card or online. Most card issuers operate 24-hour customer service departments. During that call, provide the credit card issuer with your card information, your name, the date that you believe the loss occurred or the dates of unauthorized use as listed on your statement. If you do not have your credit card number, an issuer is usually able to look it up using your name, address, and Social Security number. This phone call acts as an impetus for the credit card company to alter your account and limits your liability. A credit card company will not take these steps unless you tell them of the suspected illegal activity. Although some credit card issuers have fraud departments that regularly check for suspicious activity on each one of its cards, these departments do not eliminate your responsibility for reporting your card's loss or unauthorized use. The Fair Credit Billing Act, a component of the Electronic Fund Transfer Act, limits consumer liability for unauthorized charges made to the consumer's credit card. The faster and sooner you report unauthorized use or theft of your card, the lower your liability. Therefore, acting quickly to report the theft reduces the amount of money that you might be held responsible for due to illegally-made charges. To ensure that the letter was received, send it certified mail with return receipt requested. Keep the return receipt and a copy of the letter in your files should you need them in the future. If you are the victim of credit card theft, you should also notify the credit reporting agencies. 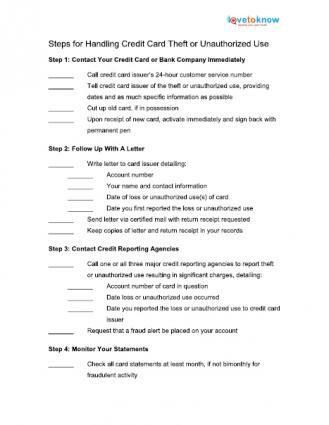 Begin notifying the credit reporting agencies within a week after notifying the credit card issuer. Notifying the three major credit reporting agencies - TransUnion, Equifax, and Experian - of the theft of your card allows you to place a fraud alert on your credit report. This prevents the thief from making changes to your credit report by opening new lines of credit in your name. Federal law requires the three agencies to share reports of fraud with each other. Therefore, you technically only need to contact one of the reporting agencies to have a fraud alert placed on each of your credit reporting accounts. However, there is no harm in contacting all three and, in fact, doing so may result in the alert being placed on all three reports faster. Also request copies of your reports to check for any impact the fraudulent use may have had on your credit. The credit reporting agencies may provide this to you free of charge after you notify them of the fraud. Preferably, check this about three weeks or a month after the fraud alert is made so that you can ensure that it is in place and that no further activity on your credit has been attempted or made. To prevent future fraud, check your credit card statements each month or bimonthly. You can usually check your credit card statements and card activity online whenever you would like. Do not take it for granted that the issue has been resolved just because you have received a new card and alerted the credit reporting agencies. Contact the credit reporting agencies and credit card issuer at the beginning of the month for approximately 3-4 months to ensure that there is no further activity you must complete or information you must supply to help resolve any unanswered issues. This ensures that you limit your liability for fraudulently made charges. A main way to prevent future theft of your card is to ensure that you always know where your cards are. To do so, put each card in a specific compartment in your wallet so that you can easily identify if one is missing by whether the compartment is empty. Also, to reduce loss of cards, only carry those cards that you need or use on a regular basis. Also, inform the card issuer immediately of any address changes. This prevents statements containing your account number from being sent to an old address and possibly being opened by someone other than you. Notify the credit card issuer of any trips you are making and the dates you will be in specific locations. Doing so prior to leaving for your trip helps the card issuer monitor your account for any activity that may occur after you have finished your trip. Due to federal regulations, responding to theft or unauthorized use of your credit card is not difficult. The key is to notify the credit card issuer immediately so that the account can be closed and you can be issued a new card.